Layering papers from a coordinated paper collection is an easy and effective way to create a stunning page. In this layout, Barbara shows you how to incorporate three unique Sassafras Lass papers into your page by using this technique. This layout was created using three papers from the Sassafras Lass Orange A'Peel collection (Orange A'Peel Dizzy Paper, Orange A'Peel Whirly Paper and Orange A'Peel Giddy Paper), blue cardstock, white cardstock, brown ink, ribbon and alphabets. Set aside the blue cardstock for your background. Cut a piece of Orange A'Peel Dizzy Paper measuring approximately 17cm by 7cm. Ink the edges with brown ink and when dry, adhere in the top left-hand corner, as shown in the layout above. Cut another piece measuring approximately 28cm by 6cm. Ink the edges with brown ink and when dry, adhere across the bottom of your page. Cut a piece of Orange A'Peel Giddy Paper measuring approximately 7cm x 22cm. Ink the edges with brown ink. Adhere a strip of ribbon across the top and then place in the top right-hand corner of your page. Cut a square of Orange A'Peel Whirly Paper measuring approximately 21cm x 21cm. Ink the edges with brown ink and when dry, adhere in the middle of your page, as shown in the layout above. Cut a piece of Orange A'Peel Giddy Paper measuring approximately 8cm x 18cm. Ink the edges with brown ink. Adhere a strip of ribbon across the bottom and then place at the bottom left of your Whirly paper square. 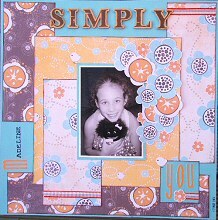 Mat your photo with white and then blue cardstock. Adhere to the centre of your Whirly paper square. Cut out flowers from the leftover pieces of the Dizzy and Giddy papers. Place around the top right of your photo. Cut a piece of blue cardstock and ink the edges with brown ink. Adhere towards the bottom right of your page, as shown in the layout above. Use alphabets of your choice to place your title across the top and side of your page, as well as on your piece of blue cardstock. Finally, finish off your page by embellishing your piece of blue cardstock with ribbon and images cut out from your patterned papers.